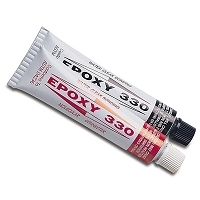 1) Put equal amounts of each tube of epoxy onto a piece of paper, or very small disposable plastic container. With a toothpick or popcicle stick, mix the epoxy parts together until it starts to thicken slightly. Put a small amount onto the etched part of the bail. Affix the glued side of the bail onto the Donut. Allow it to set and cure for a couple of hours before picking up again. 3) Take a 3 - 3½" length of wire from the spool and make a wrapped loop with one end, attaching this loop to the pearl end of one of the lengths of wrapped loop chain that you created in step #2. 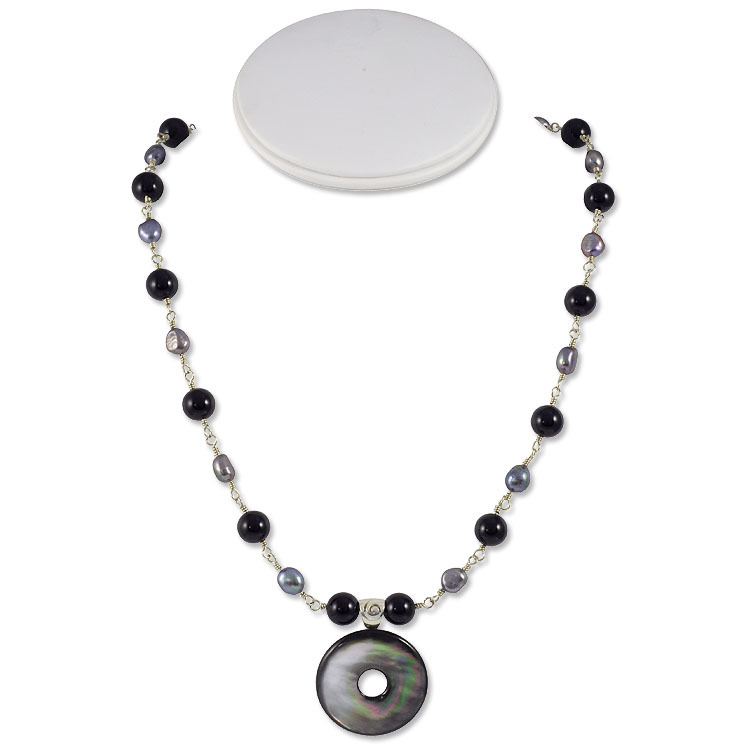 Thread on an Onyx bead, thread on the bail/pendant, and follow with another Onyx bead. Make a wrapped loop with the remaining wire, attaching this loop to the pearl end of the other wrapped loop chain that you created in the previous step. 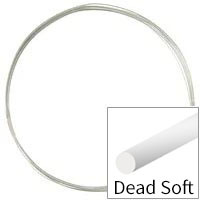 4) Take another 2 - 2½" length of wire and make a wrapped loop with one end of the wire, attaching this to one of the ends of the wrapped loop chain that you made in step #2. Thread on an Onyx bead (yes, there are two Onyx beads next to each other at the ends of the necklace :) and make another wrapped loop with the remaining wire, attaching this to one of the Jump Rings on the "S" clasp. 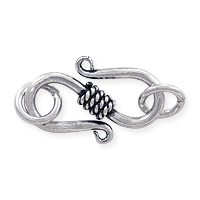 Repeat this step for the other side of the necklace. Open the part of the "S" clasp that points up slightly. Done!